Full Name: Leroy Gordon “Gordo” Cooper Jr. Entered active duty with the USAF in 1949. Graduated USAF Experimental Test Flight School at Edwards Air Force Base in California in 1957 and was assigned as a test pilot, remaining until selected by NASA. May 1963, Pilot of Mercury-Atlas 9, the final(and longest) mission in the Mercury program holding the record for the longest solo space flight for an American. August 1965, Command Pilot of Gemini 5 which featured the first use of fuel cells aboard a spacecraft. The Gemini 5 mission was an eight day flight to see if the human body could withstand weightlessness for the duration of a lunar mission. Recipient of NASA Exceptional Service Medal and NASA Distinguished Service Medal. Retired from the USAF and NASA in July of 1970 after missing out on being assigned his own Apollo command. As the back-up CDR of Apollo 10 he was in line to command Apollo 13 but the return of Alan Shepard to active flight status changed the future crew assignments. Jim Lovell was given Apollo 13, Al Shepard Apollo 14 and Cooper resigned shortly after the announcements were made. 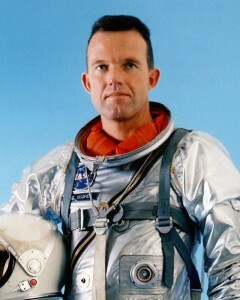 In addition to many business affiliations while still with NASA, upon retirement he was, from 1970-72 a Member of the Board of Directors and a Technical Consultant to Canaveral International Inc.
From 1970 to 1975, the President of Gordon Cooper & Associates Inc, a space design consulting firm he founded. Gordo was a member of the board on many companies, most notably as Vice-President of Research & Development/EPCOT for Walter E. Disney Enterprises Inc. from 1973 to 1975. 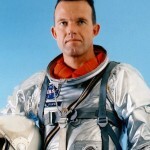 Patron of the Gordon Cooper Technology Center, established in his home town in 1970. Since 1989 he worked as a partner in an aeronautical design firm in Van Nuys, California. He returned to the Kennedy Space Center with fellow Mercury pioneers Scott Carpenter and Wally Schirra for the launch of STS 95, John Glenn’s return to space in October 1998. Authored the book “Leap of Faith: An Astronaut’s Journey into the Unknown” in July of 2000.